My name is John McCarthy and I reside in Bahrain in the Middle East. I am 44 years of age and have worked as an I.T. consultant for 20+ years - which has involved lots of sitting at a computer. For the past 4 years, I have been complaining of pain in my coccyx. Sitting down on hard surfaces has been extremely painful and rising from a sitting position has even been more so. About 2½ years ago, I had an MRI taken. [I had left it for some time as I thought this was a muscle issue.] From the MRI, it was evident that I had spondylosis - plus Grade 1 spondylolisthesis in the L5-S1. However, the coccyx appeared perfectly fine! The only major event I can recall to cause the spondylosis was when dead-lifting with heavy weights in the gym when I was 29. This was my first introduction to back pain. However, after visiting a chiropractor a few times, the pain disappeared. Up until I was 40, I have had no serious back issues - except, from time to time, spasms resulting from working at the computer. Note - I had taken up tennis in my late 30s and really fell in love with the game. I can only think that this contributed to the spondylolisthesis. Truth be told, since the time I received the results of the MRI, I have developed lower back pain too. Therefore, I have two issues, namely: coccyx pain (when sitting) and lower back pain in the L5-S1 (when sitting and when trying to sleep). Dr. Sarno's Book "Healing Back Pain" in audio format - unsure. I ignored the pain for a few weeks - which kind of worked. However, believe me, if you press my coccyx, the pain is not in my mind! Vitamins B6 and B12 - highly effective for me. Some months ago, I saw on your website that some people obtained relief from taking vitamin B6. I wish I had been aware of this years ago. Of all the treatments above, this one thing has reduced the coccyx pain (or pain in the nervous system) the most - by 70%!! My coccyx pain was so bad that my nervous system was breaking down. To be honest, I have aged as a result of this condition. Recently, while in London in Feb. 2008, on a business trip, I made an appointment to see Dr. Michael Durtnall in his Kensington clinic (see Doctors and specialists in the UK). Michael, very knowledgeable in the area of the coccyx, took an x-ray (see below) and pointed out that one of the joints seemed to have arthritis. I had several x-rays taken over the past 4 years and I have to say that Michael's was the clearest. 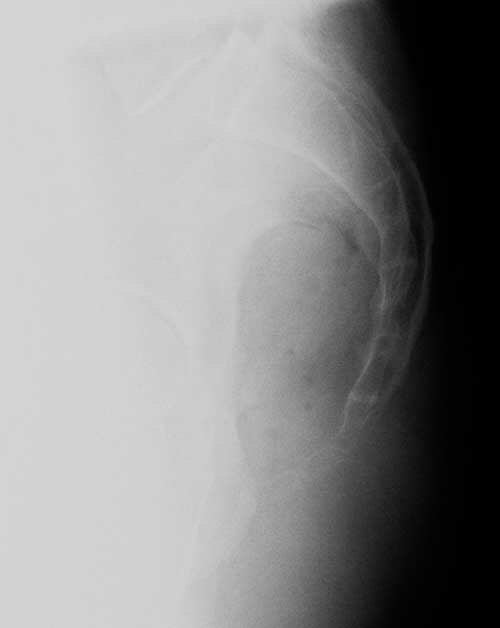 My coccyx appeared fine on all the previous x-rays. At present, I can now sit and work at my computer (provided the chair is comfortable) - without serious coccyx pain. I attribute this to the B6 and B12 vitamins. If I sit on a hard chair or on the ground, the pain in the coccyx kicks in. Moreover, if I press hard on the coccyx, there is definitely pain. At this point, I think my next steps will be to visit Dr. Maigne in Paris, with the following 'objectives': - try to arrive at a solution to address the pain resulting from the spondylolisthesis; - consider having the coccyx removed. If any of you know of a site similar to Jon's www.coccyx.org for spondylolisthesis I would appreciate it if you could let me know. I would love to be able to play tennis again - pain-free. I have been meaning to provide an update for a long time - so, my apologies for not doing so sooner. In 2008, I flew to Paris to visit Dr. Maigne and had injections into the coccyx. However, there was no lasting pain relief. At the start of June 2009, due to intense pain, I visited Dr. Jamal Saleh in Bahrain (where I live) and he suggested that I could have my coccyx removed (see Doctors and specialists in Bahrain). I asked him when he would be available to do it and he proposed the following week. A week later my coccyx was removed. Dr. Jamal did an excellent job. The procedure went very well and I stayed 1 night in the hospital after the operation. My wife drove me home - and that same day I was able to walk the short distance to the gym to do some abs exercises (very carefully). 2½ weeks later I flew half-way around the world from Bahrain to Florida with my family for vacation. Yes, I did have to sit on alternative cheeks for much of the flights! I brought a rubber ring to sit on in the hire car but by the end of my 3 week holiday I left it in Florida. With hindsight, I should have had my coccyx removed much earlier. Concerning the spondylolisthesis pain, I subsequently, had some back manipulation sessions at the Chinese Medical Cinic, Bahrain Wellness Resort. On investigation, the doctor determined that my hips were misaligned (i.e. one leg longer than the other) and he did an excellent job in correcting the problem. Since then, I have been weight-training 4 - 5 times per week since.